New Delhi: upGrad today announced a scholarship programme in association with OYO which will equip college students with relevant skill sets. The OYO – upGrad scholarship will entail 50% fee waiver to 2nd year students who are opting for career programs in Full Stack Development and Data Science. 3000 students will be shortlisted during the enrollment process on the basis of an aptitude test. While live sessions will be conducted with senior OYO experts, top performers will get an opportunity to intern at OYO. India is a promising entrant in the sector of online education and is picking up pace but unfortunately, the education system in India is unable to meet the required momentum. UGC should prioritize the development of modern education system through the globally accepted modes and embrace new recognition methodologies to impart quality education. With an exciting new generation of tools and resources altering the nature of work, Ronnie Srewvala and Mayank Kumar, co-founders at upGrad, emphasized the need of reskilling and upskilling for students to join the workforce. They also shared the company’s focus from equipping professionals with employable skills of tomorrow, to now transforming education at college level. 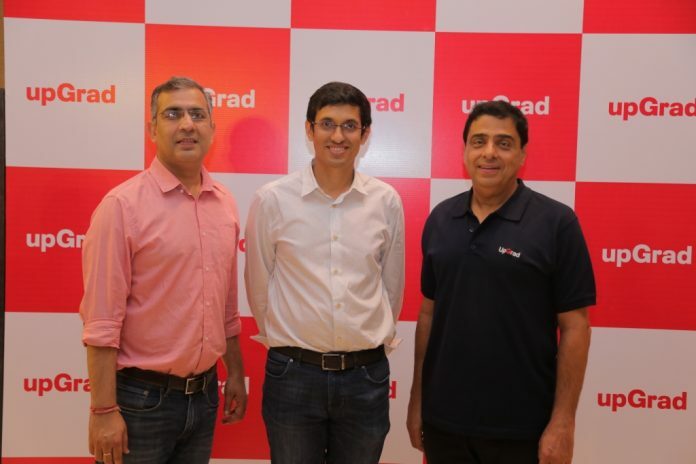 “The OYO – upGrad partnership is announced with a view to motivate youngsters to pursue higher education and solve the variation in quality education access in urban vs rural areas from grass-roots level.” said Ronnie Screwvala and Mayank Kumar, co-founders, upGrad in a joint statement. The event also witnessed representatives from silicon valley companies as well as from India’s leading startups like OYO, Healthquick and hyperDart among others.